released a new book called Through Black Spruce. 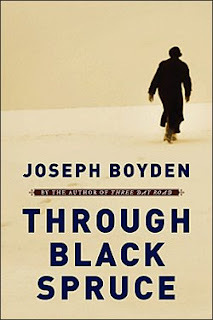 It is Boyden’s second novel and was awarded the Giller Prize last fall. Joseph Boyden is married to another author: Amanda Boyden. Amanda Boyden also published a new novel in 2008: Babylon Rolling is set in New Orleans (where she and her husband live) prior to Hurricane Katrina and has been praised as a gripping, realistic portrayal of a city in turmoil and of the city of New Orleans itself. A different vision of New Orleans is portrayed in John Kennedy Toole’s A Confederacy of Dunces. Written in the 1960s, this has long been the standard for New Orleans novels - the city here is quirky and hot, there is danger and poverty but it is presented through the lens of humour. Kennedy Toole died in 1969, the book was published in 1980 and won the Pulitzer Prize for fiction in 1981. A Confederacy of Dunces is not the only book to win the Pulitzer Prize posthumously: James Agee’s novel A Death in the Family won the Pulitzer in 1958: Agee died in 1955. Prior to writing A Death in the Familiy, Agee was involved in a famous historical project with American photographer Walker Evans. Agee and Evans spent a summer in 1936 on three farms in Alabama. Together they produced a book of photographs and text called Let Us Now Praise Famous Men that was celebrated for revealing to mainstream America the dire living conditions of poor Americans at the end of the Great Depression. Another American author famous for his depiction of the Great Depression is John Steinbeck: his novel The Grapes of Wrath is often considered the best fictional depiction of the fate of poor farmers during the depression. A more modern take on the themes presented in the Grape of Wrath can be found in a book by another American author: T.C. Boyle. His 1995 book of migrant workers from Mexico arriving illegally in California, The Tortilla Curtain, shares themes with Steinbeck and has been said to owe much to the earlier novel.